As we age, the face undergoes dynamic, cumulative transformations of the tissue structure due to the combined effects of bone resorption, weakening of the anchoring complex, facial muscle behaviour changes, and soft tissue malpositioning. Ageing changes in the mid-facial skeleton can be observed in the posterior and inferior movement of the inferior maxilla, pyriform, and orbital angle1–8. Such skeletal changes contribute to mid-facial soft tissue malpositioning and is often described as mid-facial volume loss9. Superficial fat pads in the subcutaneous area do not deplete in volume with time but in fact, according to Lee’s study10, the infra-orbital fat (superficial) volume increases with age until after 60 years of age. Deep facial fat pads do decrease in volume, by an estimated 1–2% every year from the age of 30 years; however, this can be mostly attributed to fat pad malpositioning rather than true volume loss11. Most of these observations can be explained by a weakening of the anchoring complex: a complex structure that tethers soft tissues to facial bones. Connecting to the periosteum are the retaining ligaments and the cobweb-like areolar structures. The retaining ligaments pass through the muscles then spread out as fiber septae, holding the fat tissues between the skin and the superficial musculo-aponeurosis system (SMAS) just above the muscles. This system nails the soft-tissues firmly to the bone, but as it weakens with ageing, we start to appreciate sagging and soft-tissue malpositioning, translating into prominent eye-bags, tear troughs, nasojugular lines, nasolabial folds and jowls12–14. In the past 5 to 10 years, hyaluronic acid filler injections have become a popular modality of treatment for facial rejuvenation due to the cheaper investment costs, lower entry costs for patients, and also their immediate visible results15. 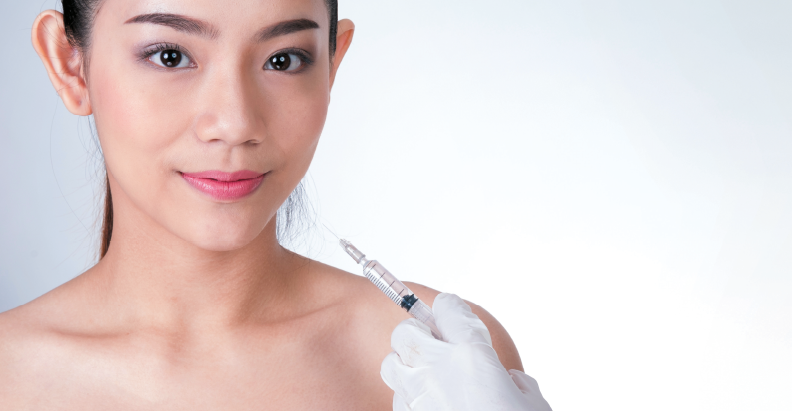 A recent survey published by the American Society of Plastic Surgeons showed that 2.4 million of the 14.2 million minimally-invasive aesthetic interventions performed in 201516 were soft tissue filler injections. However, along with the increased demand for filler treatments, the incidence of unexpected complications has also risen1. Adverse reactions can be attributed to the use of higher filler volumes, larger bolus injections, frequently repeated treatments17, as well as inappropriate injection techniques18. Facial overfilled syndrome is one such complication and is characterized by the excessive addition of facial volume leading to a distortion of facial functional anatomy and topography (personal observation). In the author’s opinion, dermal filler overload may be caused by the inaccurate initial assessment of the face, inappropriate filler choice, incorrect placement of products, and over-zealous chasing of lifting results with dermal fillers. The author believes that placement of fillers in the superficial fat pads or deep volume insertion to areas with soft tissue malposition are common mistakes that lead to overfilled syndrome. 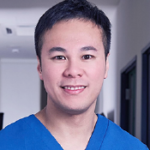 Moreover, due to the relatively smaller and brachycephalic (mesoprosopic) head shape, shallower facial depths, more forward-extended zygomatic protrusion and wide prominent zygomatic arch, Asian faces are more prone to overfilled syndrome even with a small volume of filler19–24. In the author’s experience, overfilled syndrome is frequently seen among patients of physicians who rely solely on filler treatments for lifting purposes. This highlights a prioritization of profit over artistry or lack of comprehension of the pathophysiology of ageing. While producing drastic outcomes may be desired or even requested, it is best avoided due to the risks to safety and potential for permanently distorting the patient’s natural facial structure and contours. Large bolus injections using a ‘gun-shot’ technique on the bone with a sharp needle can indeed be dangerous even with a negative retrograde withdrawal4. Micro-boluses of fillers are much preferred, for both safety and better outcomes. Multiple series of excessive filler bolus injections may lead to an aesthetically unattractive volumization and bulking up of the face. This may be a consequence of the cumulative effect of previously injected fillers25 or of filler migration, formation of biofilms and granulomas, or delayed allergic reactions6. In the triple-layered tear trough area, overuse of filler can easily distort contours and produce the Tyndall effect, requiring hyaluronidase treatment26. In one study, 4.25% of patients developed delayed cutaneous reactions to an HA-based gel filler (Juvéderm Volbella, Allergan, Irvine, CA) at injection sites, potentially due to the quantity and volume of product injected27. Inappropriate filler usage and placement, or poor technique — such as overcorrection and placement too superficially — can cause excessive filler accumulation within a single area and lead to the development of non-inflammatory nodules28. Nodules that occur due to HA fillers can be treated with hyaluronidase or, in the worst cases, surgical excision. Nodules that persist for much longer periods and resist treatment may become fibrotic, foreign body granulomas that can only be resolved by surgery. Using larger volumes of filler is one contributing factor in foreign body granuloma development, and if the filler used is non-biodegradable, then the granulomas may appear more pronounced and persist for much longer. Over extended periods of several months or years, non-biodegradable fillers undergo in situ, tissue-induced structural changes that can bring on further adverse reactions29. It is important to create widespread awareness of the possibility of such adverse effects. Overfilled syndrome could lead to an aesthetically unpleasing appearance that may worsen psychological distress and irreversibly damage tissue. Injectors must be able to immediately recognize when an overfilled condition is present and provide treatments to address it. 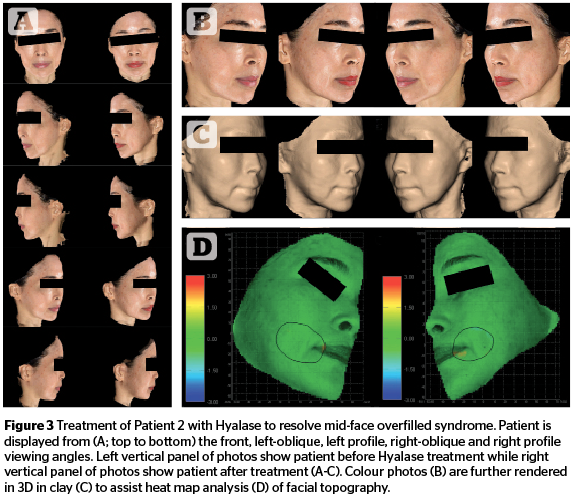 In the current discussion, the author demonstrates the features of overfilled syndrome by using the Quantificare 3D LifeViz® Micro (San Francisco, CA), a validated facial topography quantification tool, and provide hypotheses for the causes. By having such awareness, aesthetic practitioners might take a more cautious approach and not overload patients with fillers by using proper technique and selecting products wisely. 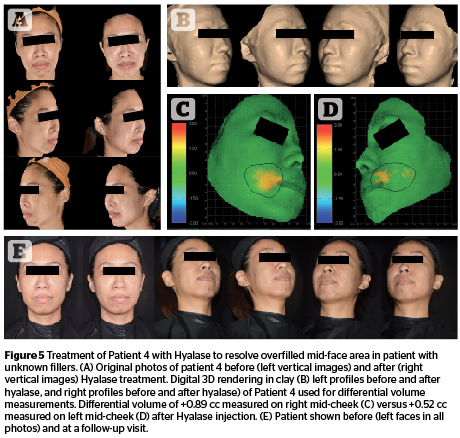 Patients who have undergone previous filler treatments, and currently display an overly puffy or ‘plastic’ appearance, were selected for this study. Patients who had underlying disease, previous severely dysmorphic conditions or undergone surgical intervention, were excluded. Patients were actively recruited through clinic patient pools. Hypothetically, overfilled syndrome is caused by incorrect assessment, injection plane and techniques, choice of products, and volume administered. In the first instance, to determine whether the mass within the affected area was due to the presence of native fat or to injected filler, gentle finger pinching and palpation of the area thought to contain the mass was performed (Figure 1). The observation of a slightly translucent area of skin, under which exists a discrete, solid and mobile lump of filler, is a key indicator of overfilling. Photographs were then analyzed in two dimensions using Quantificare 3D LifeViz® Micro. This technology allows plain photographs taken before and after aesthetic procedures to be reproduced fully as 3D images of the entire face for the analysis of facial volume, contours and wrinkles30. Overfilled areas or lumps were injected with 1500 IU of hyaluronidase in 5 cc of lidocaine using 30G needles. It was imperative that this injection punctured the filler lumps and the needle penetrated the biofilm or capsule surrounding the filler mass. Quantificare LifeViz® technology was used for quantification of volume changes after treatment and to produce a three-dimensional (3D) reconstruction of these results. The before and after photos were compared in both 3D and clay mode. Patients were photographed at follow-up visits at 2–3 weeks or, where possible, at 3 months post-treatment with Hyalase. Correction of overfilled syndrome was performed using dissolution of the filler using hyaluronidase and subsequent filler reinsertion. No baseline data was collected for filler treatment as all patients already had this intervention at the study inception. However, baseline data was collected for the occurrence of complications after corrective intervention, although none occurred. Patient 1 was assessed to have overfilled syndrome in the infraorbital area due to placement of filler in the mid-face. Patient 2 was assessed to also have overfilled syndrome in the mid-face due to filler placement. Patient 3 was assessed to have an overfilled nasal dorsum due to overfilling with Juvéderm Volbella®. Patient 4 was assessed to have overfilled syndrome in the mid-face area due to placement of an unknown filler type. 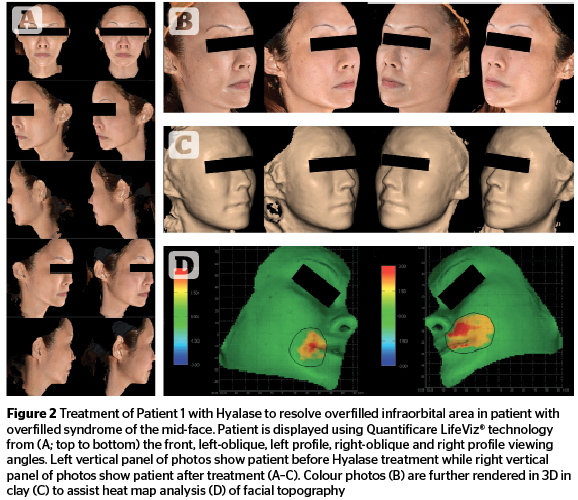 In all cases, following Hyalase treatment, excessive tissue volumization was reduced across the entire face, most noticeably in the previously, over-inflated mid-cheek (Figures 2, 3 and 5), buccal (Figures 2 and 5) and periorbital areas (Figures 3 and 5), with the result of more natural and even contours. Patient 3 (Figure 4) also displayed a visibly narrowed nasal dorsum after Hyalase treatment. Normally, a true overfilled syndrome is easy to identify as the topography of the face is overtly distorted. However, identification of a borderline overfilled syndrome is less straight-forward. Simple exercises can be used to identify such overfilled conditions; palpation of the area suspected of being overfilled could be performed with both the thumb and index finger to assess the fluidity of the substance beneath the skin. The medial infraorbital area is the area most easily identified as it is generally the thinnest-skinned area of the face, with minimal fat. By compressing the structures, a soft, fluid-like consistency, which appears translucent in light, generally confirms the diagnosis. In this study, still photos were captured but overfilled areas are most noticeable during muscle animation when filler accumulates in discrete and visible lumps beneath moving muscles. Practical management of overfilled syndrome requires the direct injection of hyaluronidase with lidocaine into the areas suspected to contain excessive fillers. It is important for the physician to identify the layers in which the fillers could have been deposited. However, it is often very difficult to detect the clear borders of filler locations. 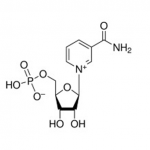 Thus, injections are performed at multiple depths and angles in the hope of penetrating multiple biofilms or capsulations to allow hyaluronidase to work. Multiple sessions of hyaluronidase treatments may be needed to achieve significant volume changes. The use of hyaluronidase may be ineffective if filler implants have been present for a longer time, performed in multiple sessions, or have migrated extensively. In medicine, prevention is still better than cure and it is important to create awareness among practitioners on the severity of the overfilled syndrome. Many physicians do not consider overfilling to be problematic as they assume that this will resolve naturally after several years. As the overfilled structure is generally unable to withstand gravity and ageing, the distortion actually worsens with age, eventually leading to an unnatural looking face. More research into filler longevity is needed, for example, histological studies on the changes in tissues, after a certain period of time, with filler implants in the deep subcutaneous layer. It is also important to identify the volumetric changes that occur with ageing and to correct this accordingly. Most mid-face deflation was believed to be due to sub-orbicularis oculi fat (SOOF) volume depletion31–34 and that a normal person has 2–3mL of SOOF volume at adulthood. In the author’s opinion, should depletion of fat occur at a rate of 1–2 % per year, a maintenance dose of 0.02–0.06mL of fillers would be needed per year. To correct 10-years of volume loss, an estimation of not more than 0.2-0.6mL of filler should be deposited only once and a maintenance dose subsequently continued. Also, it would be interesting to determine the distribution of fillers after placement underneath the skin. With larger boluses, it is quite possible that fillers are more prone to migrate or be ‘squeezed’ to other areas, hence losing their projection and causing a wider spread of fillers to unfavorable areas. Studies comparing the migration rates of fillers of different volumes with fillers of different rheology will help physicians understand the volume limits underneath the skin. Whether fillers are actually placed correctly in the intended area of fat, bone or soft tissue loss, is not known. Similarly, if the amount of fat and bone loss or other factors are taken into consideration, simply adding 4–5cc of filler in the cheek area can produce an exaggerated, overfilled appearance. Hyaluronidase exists predominantly in the skin, but fillers are generally injected subcutaneously or deeper, thus precluding filler removal unless treated with surgical excision or an immune-based disintegrative reaction, or filler migration away from the point of injection. Occasionally after treatment, when patients view their treated area(s), they notice a flattening of the area. This has not resulted from filler disintegration; it is due to filler spread or migration away from the intended target site. Overfilled syndrome does not necessarily occur after a single session or after the use of excessive filler volumes. Of greater importance is the fact that it now more commonly occurs after several years of filler use and the unintended accumulation of filler in a specific site. Although some fillers are thought to be biodegradable, this has not been proven. It is plausible that filler particles continue to exist for several years, and may migrate to or integrate with unintended tissue layers. Injection of large boluses creates more tension within the treated tissues, prompting an immune response that creates a biofilm or fibrous ‘cage’ around the foreign body. To remove these bodies, it is necessary to inject hyaluronidase directly into the masses. Alarmingly, the author has observed patients who claim not to have received any filler injections in the prior 5-6 years, and yet, still appear overfilled or filled. This has prompted the question of whether or not biodegradable fillers do actually completely disintegrate and whether the mass leading to the overfilled appearance is comprised of collagen fibers? In the latter instance, treatment with hyaluronidase immediately eliminates the mass, indicating that the mass was indeed created by fillers. It is essential to note that during hyaluronidase treatment, mere flooding of the filler-filled area does not eliminate the mass, as the hyaluronidase is unable to penetrate the biofilm cage surrounding the filler mass. To remove such lumps, multiple needle punctures must be delivered to the site to ensure that one or more biofilm-caged filler masses have been directly injected with hyaluronidase. After this, removal of the mass is effortless. Once a face is overfilled and the native tissue structure becomes distorted, diminishing the supplementary volume with hyaluronidase will help minimize distortions but may not necessarily restore a natural appearance. Therefore, it is very important for the medical aesthetic community to increase patient awareness of overfilled syndrome to prevent this from occurring. Aesthetic practitioners must make an effort to avoid overfilling and learn to apply caution to their filler selection, volume used and chosen location. By ensuring that practitioners are not deliberately causing harm by overfilling, the quality of aesthetic medical outcomes also improves. One way of facilitating this process is to understand how the five key tissues in the face, namely the skin, fat, anchoring complex, muscles and bones, contribute to ageing. It is vital to target ageing in all five layers by combining different modalities, and acknowledge that this strategy has now come of age — combination treatment approaches are no longer simply a trend but have evolved to become a necessity. By demonstrating that excessive and inappropriate use of fillers can be detrimental in the long-term, this study brings into new perspective the ‘injectology’ of fillers. In addition, these results should encourage injectors to rethink their techniques, the products chosen, and the expectations that they set both for their patients as well as themselves. Whether they can sufficiently understand, effectively assess and successfully manipulate the patient’s facial anatomy will be apparent in the long-term outcomes for each patient encountered. Replenishing volume to attain a more youthful appearance yields excellent results, enabling the deflating face to regain volume and firmness. 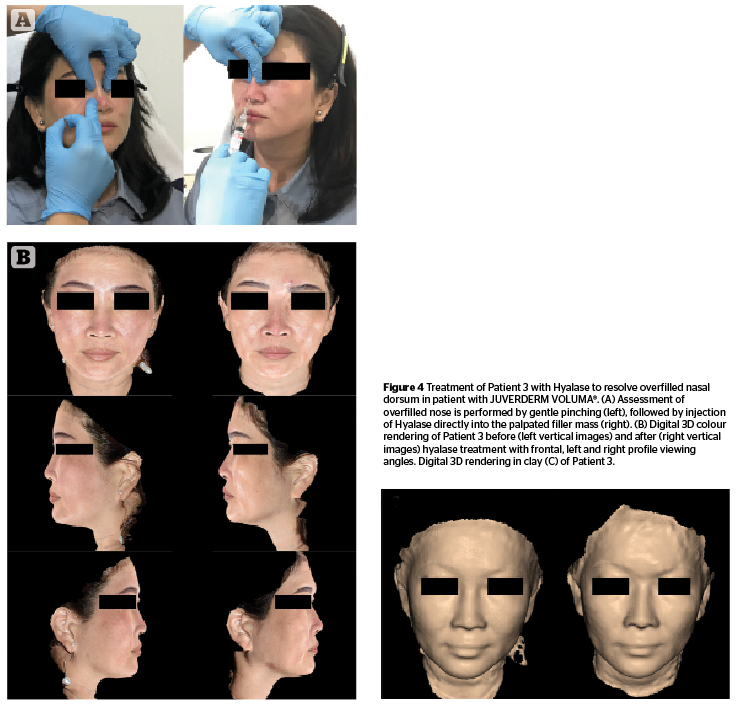 This phenomenon of mild-to-severe facial distortion induced by incorrectly used dermal fillers is especially apparent among Asian patients who have smaller bone structures within the mongoloid skull. Having an awareness of the overfilled syndrome is instrumental among aesthetic practitioners in preventing the creation of distorted, unnatural and aesthetically unappealing faces. The cause of overfilling is multifactorial. Incorrect assessment due to lack of experience or training, incorrect filler placement in fat compartments, such as the superficial fat pads or medial infraorbital areas, poor selection of product, and problematic injection techniques can all lead to the overfilled syndrome. Often, an incorrect volume of filler is delivered due to physician over-zealousness and desire to produce a ‘wow’ effect, but can distort the facial structure. Repeatedly placing fillers in the same tissue compartment over multiple treatment sessions is generally the cause. Declaration of interest Ting Song Lim is a consultant for Merz Asia Pacific. Merz Asia Pacific sponsored the preparation of this manuscript.. Acknowledgment The authors express their deep appreciation to Merz Asia Pacific Pte Ltd for funding the preparation of this manuscript, and Shawna Tan, for manuscript writing and editorial assistance. Lee JI, Kang SJ, Sun H. Skin Necrosis with Oculomotor Nerve Palsy Due to a Hyaluronic Acid Filler Injection. Arch Plast Surg. 2017 Jul;44(4):340-343. Gosain AK1, Klein MH, Sudhakar PV, Prost RW. A volumetric analysis of soft-tissue changes in the aging midface using high-resolution MRI: implications for facial rejuvenation. Plast Reconstr Surg. 2005 Apr;115(4):1143-52; discussion 1153-5. Rohrich RJ, Pessa JE. The retaining system of the face: histologic evaluation of the septal boundaries of the subcutaneous fat compartments. Plast Reconstr Surg. 2008 May;121(5):1804-9. Buchanan DR, Wulc AE Contemporary thoughts on lower eyelid/midface aging. Clin Plast Surg. 2015 Jan;42(1):1-15. Michael H Gold. 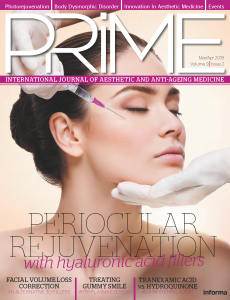 Use of hyaluronic acid fillers for the treatment of the aging face. Clin Interv Aging. 2007 Sep; 2(3): 369–376. Signorini M, Liew S, Sundaram H, De Boulle KL, Goodman GJ, Monheit G, Wu Y, Trindade de Almeida AR, Swift A, Vieira Braz A; Global Aesthetics Consensus Group. Global Aesthetics Consensus: Avoidance and Management of Complications from Hyaluronic Acid Fillers-Evidence- and Opinion-Based Review and Consensus Recommendations. Plast Reconstr Surg. 2016 Jun;137(6):961e-71e. van Loghem JA, Humzah D, Kerscher M. Cannula Versus Sharp Needle for Placement of Soft Tissue Fillers: An Observational Cadaver Study. Aesthet Surg J. 2016 Dec 16. pii: sjw220. Allanson JE, Cunni C, Hoyme HE, McGaughran J, Muenke M, Neri G. Elements of morphology: standard terminology for the head and face. Am J Med Genet. 2009;149A(1):6-28. Funt, D., & Pavicic, T. Dermal fillers in aesthetics: an overview of adverse events and treatment approaches. Clinical, Cosmetic and Investigational Dermatology 2013, 6, 295–316.